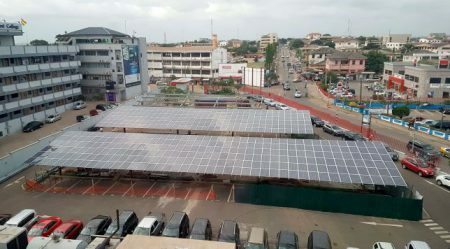 Accra Solar 272kW car-park PV Hybrid Plant has been designed to meet most of the electricity demand at the Headquarters of the client by the use of solar energy, in order to reduce operational risks caused by the unstable grid and the high operating costs of diesel generation. The goal is to increase electricity autonomy, reduce electricity costs, and enable better electricity planning and forecasting in a safe, reliable and scalable manner. The project supported by a French group, when implemented, will contribute to the Group’s overall energy objectives and help towards reducing carbon footprint. VERGNET is providing services to the client for the turnkey delivery of the solar PV farm and the entire car park structures upon which the PV plant are being installed. The PV plant will be integrated with the existing diesel plant thanks to its Hybrid Wizard™, system which maximizes solar energy penetration with real-time grid power quality feedback. This will allow optimization of solar power production with existing diesel power production to maximize fuel savings. It is being installed. The carports are built on car park structures mounted on the existing parking space of the company. VERGNET worked on the preliminary analysis so to size and design the optimal PV Capacity that gives the highest average penetration, hence the optimal savings for the client. Work on site is going well. Most of the car-park structures are completed and PV panels are being installed. In the meantime, connection works are in progress. The project is planned to be commissioned by the end of November. VERGNET has an established track-record and experience in providing renewable energy solutions in 14 African countries. Ghana is a new opportunity for the company to develop sustainable projects. Find out more about VERGNET’s hybrid energy solutions, solar PV solutions and wind energy solutions and solar applications or read our case studies to learn about our renewable solutions in action throughout the world. Follow us on Twitter or LinkedIn to stay up to date with latest news and projects.